Teaching Legend | Not yet a legend, but I have a growth mindset. Not yet a legend, but I have a growth mindset. It had been highlighted as an ‘area for improvement’, prior to my arrival. Having reviewed the current policy, it just didn’t feel right (yes, I know what you’re thinking – the power of emotional intelligence. Goleman @DanielGolemanEI would be proud). But most importantly, because according to the Education Endowment Foundation (T&L toolkit) feedback is one of the most effective ways to add impact to student progression. Policies don’t make us, we make the policies. We were not going to mark more than one piece of student work in a week. (Context: In my school, we operate on a single week timetable and all five year groups have five or six lessons of Maths, every week). The focus of that one piece of marking would be to diagnose misconceptions and to offer specific feedback in addressing these, followed by appropriate question(s) for the student to attempt. In cases where students had shown a sound understanding on the topic, the teacher would provide relevant ‘challenge’ questions to further stretch students’ understanding and application). We could certainly view other pieces of work (that teacher curiosity), for literacy and general understanding, but would not actually mark it. (Context: This was mainly to get away from the ‘tick and flick’ culture, which can be misleading for students. Especially in cases where there may be fundamental errors in student work, but it may have been ticked anyway. What message does that convey? Students were to be given specific time to respond to the feedback. This is a big one. Why waste time marking and writing comments, if the student is merely going to look at them (and in my case, mock my ‘below the standard’ handwriting)?! Homework would be marked by students, using self-assessment or peer marking. We could still mark this as our ‘one a week’, provided it was every four or five weeks apart (Context: This was on the back of introducing a universal homework system, where students would be asked to work through a range of questions. The objective here was to reinforce familiarity with key skills, by constantly revisiting them). Teacher time is valuable and what we do has to be practical and sustainable. The feedback we offer has to have impact on student progress. Otherwise, what is the point? Students should definitely be working harder than the teacher. This only allowed me a brief introduction into this new way of marking that we were going to start working towards. My aim had always been to tackle this in more depth in our next departmental meeting, as part of a carefully structured CPD session. So in the next few weeks, all I could do was try to gauge (detect) how well these changes had been received. Yes, there is definitely an upside to being an avid 007 Bond fan. I certainly did manage to hear (detect) some positive feedback. I also managed to walk in on one of my colleagues whilst ‘in the act’ of marking way more than what we had agreed. For some, I guess, marking ends up becoming an addiction. We were able to drill down to the true objective of marking – student progress. There was a healthy discussion around who we mark for, which included a number of stakeholders. This gradually shifted towards who we ought to mark for. For me, this point is key as it then drives the way in which we approach marking and feedback. I shared some of the research by Education Endowment Foundation into the impact of feedback on student progress, especially in closing the gap for Pupil Premium students. Approximately 50% of our school population is Pupil Premium. few from other subject areas! 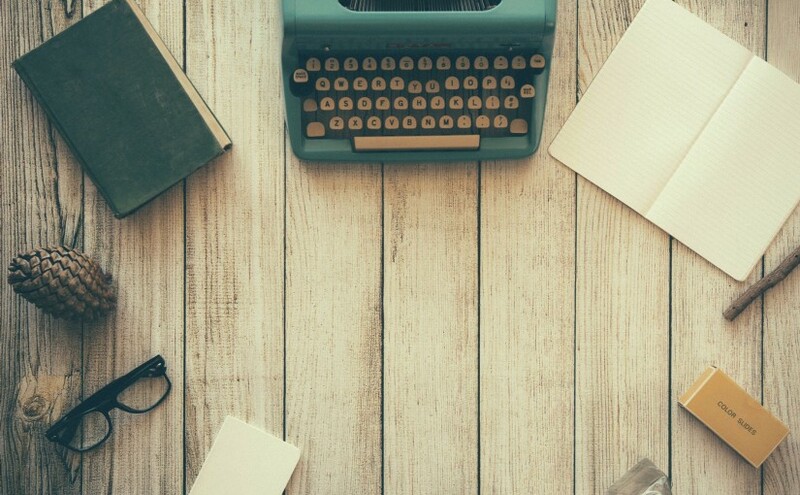 A discussion on how we shouldn’t hesitate in directing students to re-draft a piece of work, if it doesn’t meet our expectation. This could be in relation to the way in which a question had been worked through or simply to do with its presentation. It helps in creating a culture of high standards, which of course is what we want from our students. This has worked really well for me as students have begun to actually take heed of my warnings during lessons. 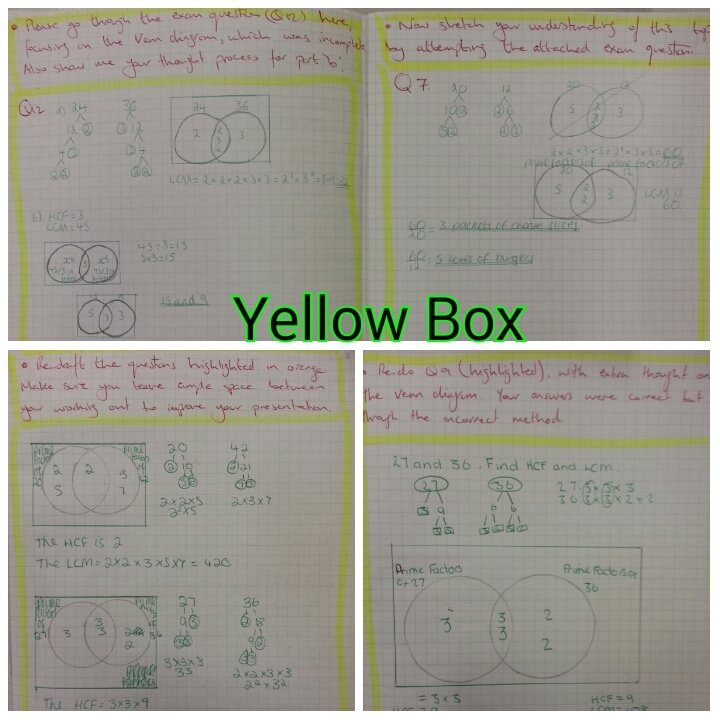 Some initial examples of ‘yellow box’ being used to feedback on student work. It wasn’t long after this that we were inspected. Although still in its infancy, feedback in the Maths department was commented upon. This only increased my determination to continue this journey that we had now embarked on. It was also around this time that I read an interesting post (so interesting that I can’t remember where it was from), which forced me to reflect on my recently delivered CPD session. As teachers, it is an expectation that we allow our students the opportunity to put into practice what they have learnt, thereby allowing new concepts to sink in. On reflection I realised that I had only shared, what I believed to have been effective examples of diagnostic comments with my team. How could I expect this alone to alter everyday practice when my team had not had the opportunity to develop this, let alone embed it. So in our next meeting we spent a dedicated portion of time developing diagnostic comments, discussing them and offering each other feedback on how to improve these. This was done using real examples of work from student exercise books and proved to be a very productive session. 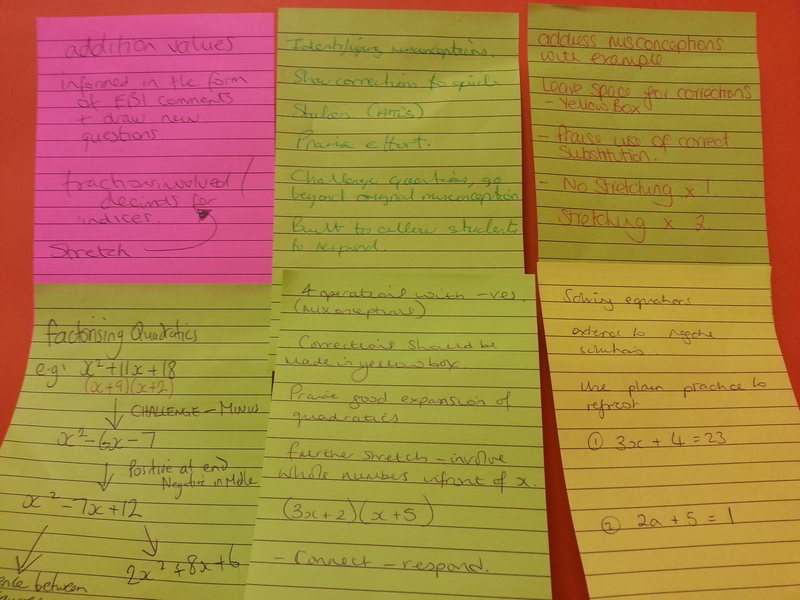 Examples of staff engagement in developing comments to feedback to students. Thanks guys! In a recent book review some real positives, pertaining to this initiative, have come to light. Included amongst these is the use of the yellow box, the consistency with which students respond to the feedback and the challenging questions, through which students are being asked to demonstrate their understanding. I would love to hear your thoughts on my endeavour thus far. How can I improve? What am I missing? Please feel free to leave me a comment below.